Migrants walk inside a former concert venue serving as a shelter in Tijuana, Mexico, Dec. 3, 2018. Immigration authorities call it a "myth" that officers have turned asylum-seekers away at ports of entry. But 13 asylum seekers claim otherwise. They are plaintiffs in a lawsuit that is challenging what they say is U.S. Customs and Border Protection's practice of turning back migrants who present themselves at U.S. ports of entry along the U.S.-Mexico border. The lawsuit was originally filed in July 2017 but amended recently to include more evidence of a policy coming from the highest levels of CBP. Lawyers say the has created a humanitarian crisis at the border. "The goal of the turn-back litigation is to get CBP to comply with the law, which requires them to process the asylum seekers at ports of entry," said Melissa Crow, senior supervising attorney with the Southern Poverty Law Center's Immigrant Justice Project. The class action, called Al Otro Lado, Inc. v. Nielsen, also highlights the Trump administration's practice of metering or limiting the number of asylum seekers allowed to enter the country each day once they present themselves at a port of entry. Documents filed in the U.S. District Court Southern District of California by the Southern Poverty Law Center, American Immigration Council, Center for Constitutional Rights, and a Los Angeles-based law firm show that around 2016, high-level CBP officials under the "knowledge or authorization" of U.S. government officials "adopted a formal policy to restrict access to the asylum process at ports of entry by mandating that lower-level officials directly or constructively turn back asylum seekers at the border." Roger Maier, a spokesman for CBP, told VOA in an email that as a matter of policy, the agency does not comment on pending litigation. In general terms and not related to the lawsuit, he wrote, CBP is not denying or discouraging travelers from seeking asylum or any other form of protection, or from claiming fear of return to their home country. "When our ports of entry reach capacity, CBP officers' ability to manage all of their missions — counter-narcotics, national security, facilitation of lawful travel and trade — is challenged by the time and the space to process people that are arriving without documents. From time to time, we have to manage the queues and address that processing based on that capacity," Maier said. The delays at the border, however, are real. Migrants are waiting for weeks, and in some places, months to present themselves at ports of entry. Two weeks ago, a peaceful protest by migrants at the San Ysidro port spiraled out of control and led border patrol agents to spray the crowd with tear gas. Crow blames the "queue management procedures" of the Trump administration. "The so-called crisis on the ground has been manufactured by the Trump administration. The border has always been a source of tension in the U.S., in the halls of Congress, in the policy arena and in U.S.-Mexico relations. But what's going on now is a product of really bad policy by the Trump administration," Crow said. "We've asked for a declaration — a declaratory judgment from the court clarifying that CBP's current conduct (turnback/metering) is in violation of domestic law," Crow said. The practice of metering, at least, is not new. According to court documents, it happened under the administration of President Barack Obama but has intensified since President Donald Trump took office. Migrants, part of a caravan of thousands from Central America trying to reach the United States, stand next to a U.S. Customs and Border Protection official in San Diego County, after crossing illegally from Mexico, Dec. 2, 2018. The case stems from a complaint in 2016 during the Obama administration against the Department of Homeland Security's Office of Civil Rights and Civil Liberties on behalf of adult men and women, families and unaccompanied children who said they were denied entry to the United States at ports of entry along the U.S.-Mexico border, even though they claimed an intention to seek asylum. Under U.S. law, anyone arriving at a port of entry or crossing in between ports of entry is eligible to apply for asylum if they have a fear of returning to their home country. Even so, asylum is not easy to get. Syracuse University's TRAC has found that 65 percent of applications were denied in 2018. In September, Judge Cynthia Ann Bashant refused a government motion to dismiss the suit, allowing it to go forward. "She found that we had established a widespread practice and pattern of turnbacks at ports of entry," Crow said. "It gave us an opportunity to amend our complaint to provide more evidence of a policy coming from the highest levels of CBP." On Nov. 30, the U.S. government filed a new motion to dismiss the case. In a call to reporters on Friday, civil rights and immigration advocates said the current situation in Tijuana near San Ysidro is one of "desperation." Erika Pinheiro, policy and technology director at Al Otro Lado, said people have slept in the rain, and the conditions are "dire" in an overcrowded sports complex with multiple cases of respiratory illness. The complex was closed Saturday, and migrants have been moved to a former concert venue. Nobody knows how long they will have to wait. Those hoping to apply for asylum in the United States have put their names on a waiting list that reportedly already had 3,000 signatures before the arrival of the caravan in Tijuana. Vilma Morales had been waiting for almost a week on the El Paso del Norte Bridge between Mexico and the U.S. when VOA encountered her. Morales, who was traveling with her one-year-old son, told VOA that "it's a good day" when CBP takes 20 to 30 people into the processing center. Representatives of nongovernmental organizations along the border said they are engaged with U.S. officials in discussions to figure out what an actual solution would look like. "I've been in the refugee camp — almost every single person I spoke to wants to wait. 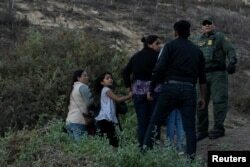 People generally do not want to cross the border illegally. … And if you see the conditions (of the camp), it is just not possible. … I would say the mood is one of desperation and bewilderment," Pinheiro said.